If you drive West from St Louis (as I did Thursday after my check-up*) you will occasionally hit a pocket of air that smells a little sweet, and a little burnt. It is the product from the charcoal kilns up near Vienna, one of the larger centers for making charcoal in the country. Apart from its use in making barbeque, charcoal has other beneficial uses, and it is projected that it has been used over many millennia. Modern consumption in the United States runs around 375,000 tons. Making charcoal from poor-quality timber and sawmill waste is a process that has changed little in centuries. Before it becomes dimensional lumber, every log harvested in the Ozarks first must be sawed square. The bark covered slabs produced by that first cut become the raw material for charcoal briquettes. Seasoned hardwood is sealed in an air-tight enclosure and allowed to burn with the barest minimum of air. Just like in a woodstove with the damper closed, the wood slowly turns to almost pure carbon as its lighter, more volatile components are driven off by heat. This process, called pyrolysis, can occur in a pile of wood buried in a hole in the ground or inside a metal or concrete box called a Missouri-type charcoal kiln. For years, making charcoal was one of the few sources of income for people in the Ozarks. However, in the earlier times the kilns were made up with earthen and turf walls to seal in the charcoal as it cooked. And it is that technology that I want to return to today in another post on Oil Shale, in this case discussing the EcoShale project in Utah. 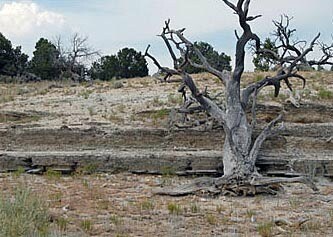 The Ecoshale project is being promoted as a new approach to obtaining oil from the shales of Utah. The company proposing this “In-Capsule” process had a fair-sized booth at the MinExpo meeting in Las Vegas a couple of years ago, that drew my attention. I stopped by and watched the video (twice) picked up literature, and talked to one of the folks at the booth. Since there is considerable oil (well actually kerogen) locked up in the shale (perhaps as much as 1 million bbl/acre it is worth seeing what they have planned. I will include a few thoughts as I go through the process. Those in the UK might want to visit Ian West’s site which gives some history to shale burning in the UK. Until now I have largely, in the recent posts on oil shale, focused on the thicker layers of oil shale in Colorado, but there are places in Utah where the oil shale near the surface is more than 10 ft thick, and where the shale will yield more than 25 gal/ton. With prices of oil fluctuating, the grade at which production becomes possibly economic will vary, but for the following discussion I am going to assume that a ton of ore will yield about ¾ of a barrel of oil. I will also assume, for simplicity, that a ton of shale occupies 14 cu. ft. before it is mined. The plans for the project, at the time of the MineExpo presentation, were that it would be scaled to produce 30,000 barrels of oil per day, at an anticipated cost of roughly $3 billion. This has now been split into plans for a 9,500 bd commercial project prior to that larger operation. Red Leaf, the company, holds leases to 17,000 acres of this shale (with an overall average of 25 gal/ton, ranging up to 70 gal/ton). The first thing that happens at a site is that the overburden, and shale that doesn’t have a high enough oil content is removed and stored for site remediation after the process is over. (I am going to use oil to describe the hydrocarbon content, ‘cos it’s shorter to write than kerogen. ) This will require a significant area, since the volume of rock being uncovered every day is going to be large. There are going to be three operations going on at one time, in order to make the process work. The first is the removal of the overburden, the second is the preparation of a site to act as a retort, and the third is the mining of the oil shale and the building of the retort. The retort is then left in place to “cook” the oil/kerogen over a period of some 90 days, before the site is reclaimed. 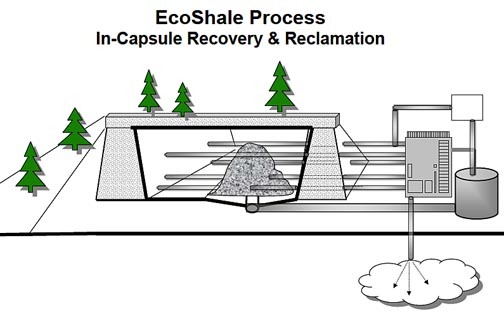 Retort preparation will take place in a space where the shale has already been taken out. (This requires the initial removal of an additional volume of shale that has to be set aside and stored to give the space for the first retort to be put in place.) This is because the underlying bed must be prepared, and the infrastructure for the retorting has to be put into place. To get just a little ahead of myself, the process of retorting the shale involves mining the shale, and then building the broken rock into a crushed zone, through which pipes have been placed, that will carry natural gas to heat the rock. The rock is then covered with a thick layer of an impermeable rock (for simplicity I am going to assume a crushed claystone) that will act as a seal. In this way the shale is encapsulated, and as the heat from the gas works then so, as with the wood in the charcoal kiln, the rock is processed, the hydrocarbons driven off, and collected in drainage tubes that are interspersed through the layer. If we look at the operations required for the full 30,000 bd operation. The mining of the shale will require some 40,000 tons of rock to be mined and moved every day for production, as well as the removal of the overlying rock from the next batch down the strip. This is equal to around 560,000 cu ft of rock. For the sake of discussion, if the strip being mined is 50 ft wide and the shale seam is 35 ft high, this will require that each day the mine will move a panel that is 320 ft long. However this isn’t all the rock that is required. 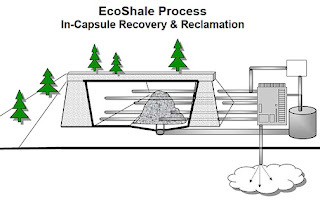 Because before the shale that is mined can be placed in the retort zone, a layer of clay will be placed over the pit section in order to give an impermeable barrier below the shale to stop contamination of the underlying rock and any water that it contains. This layer is going to have to be very thick, since the oil shale above it is going to be heated to the point that it releases the oil. This takes a temperature of 900 deg. At that temperature the clay will bake and becomes very brittle, so the clay layer must be thick enough to allow for this and allow enough temperature drop to leave the lowest layer still flexible enough to act as a seal. Let’s assume for now that this is going to need a layer that is 3 ft thick. (I’ll come back to this later.) In a recent test of the process the seal provided also included a plastic sheet as well as bentonite. (Presentation slide 19). 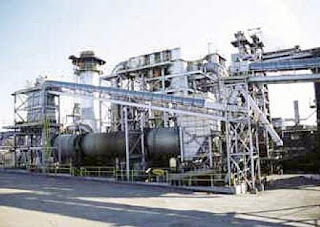 By going through this process the mine is creating a “use once” retort that encapsulates the spent shale, and collects the retorted products without some of the disadvantages of a more conventional retort. 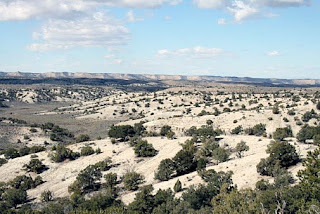 These include (from the brochure) protection of groundwater, lack of need to sequester tailings, and obviation of the problems of retort clogging and moisture retention within the retort. Now the mine has to seal the retort to keep the retorting heat within the shale and not to let it, or the gas and oil generated out. So a cap will be placed over the broken shale and, for the same arguments as above we will assume for now this is also going to be about 3 ft thick. (I hope it doesn’t rain much in this part of Utah. 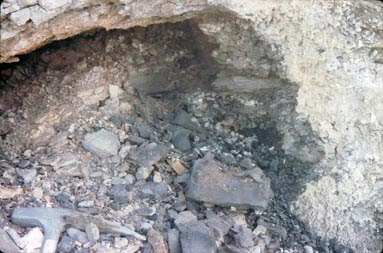 The impact of water on clay/shale at 900 degC is spectacular, since the clay shatters explosively and is easily eroded). This will take the pile up to 62 ft high, which is quite a bit higher than the original 35 ft. It is interesting that the brochure suggests that this will be a “low temperature, stationary heating” given that the initial temperatures to liberate the shale have been documented (as noted above) at 900 degC. And my memory suggested that that number also cropped up in my conversation at the booth. It will also have to have a front panel of a sealing rock and clay placed over the face of the section, in order to complete the capsule. 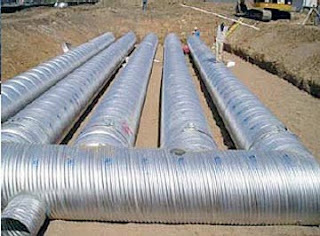 Now the heating pipes are connected to a natural gas burner that will feed the hot gases into the heating pipes, gradually bringing the shale up to the temperature where the transformed oil can flow to the collection pipes, and any gas produced can also be collected. The booth spokesman told me that they anticipate that the natural gas needed can be collected on site, and that the heating will take a total of 90 days to heat the shale to the point that all the hydrocarbon content has been recovered. That means that the retort section of the mine will be roughly (90 days at 320 ft per day) 5.5 miles long. After retorting is complete, the heating element will be disconnected and the shale and overlying clay allowed to cool. It will then be covered with the initial overlying rock that will be restored to roughly original contour, and the ground fertilized, seeded, and the ground cover re-established. While the brochure cites the approbation of the Governor of Utah, the commendation for the project was written at the time that the price of oil was some $120 a barrel, so we may have to wait a short while until it gets back to that level before the project starts to take off. By December 2008 the project was reported to have invested some $15 million in research and development of the process. They are currently in development of a large-scale pilot demonstration. Information on the web site, however, is a little sparse concerning current progress, through oil was apparently produced in November 2009. Ecoshale's synthetic product has properties rated by the American Petroleum Institute (API) as 39 condensate oil and between 34 and 35 prompt oil with no fines, or impurities, in the oil. Based on the test study, Nelson projects full-production at 30,000 barrels a day would cost $20.21 per barrel, not including transportation. My concerns with this come in the transition from a single retort which can be built to quite high standards, to the operation of even a smaller continuously operating system, where there are likely to be considerably more and larger problems with operation than appear evident at this stage in the process. * My thanks again to those concerned after my eye problem arose, the surgeon told me yesterday, 3 weeks after it happened, that I now am back to 20/20 vision – albeit using glasses. I remain highly impressed with what modern surgery can achieve.